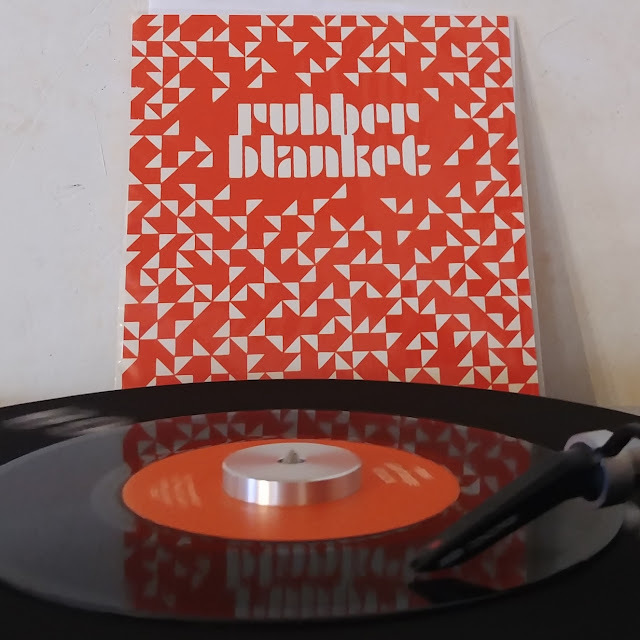 Comprised of Lars Finberg (A-Frames/Intelligence) and Jun Ohnuki & Brad Eberhard of Wounded Lion, Rubber Blanket isn't just the punchline to a sick burn that's best served at summer camp. It's also something that makes for waggish reverberations. There's an ingenuous sense of wonder for the day to day mundane going on lyrically on this. Over a Warm Jets-ish Eno kinda thing that sounds like its sense of balance is corrupted and a melody of just a few notes, "New Garbage Truck" bounces about in an odd way while giving a detailed account of the newest trash hauler being spotted in the neighborhood. It's flip, "Pedestrian Walkway", is about, the faces and things you see when while afoot in the city. A spartan synthy stroll which accompanies it helps keep thoughts chipper even if the crowd around is vexatious.